In Excel 97-2003 there is always a option in Tools>Options on the International tab to change the default sheet direction. But in Excel 2007 there is only a option to change the default direction in Office Button>Excel Options...Advanced if you have installed at least one RightToLeft language. 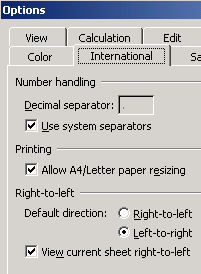 In Excel 2010-2013 they add this option back in File>Options...Advanced. The default sheet direction for Excel you can change with this code line in every Excel version. In Excel 97-2003 there is always a option in Tools>Options on the International tab to change it. And you have this option in Excel 2007-2013. Select "All Commands" In the "Choose commands from" dropdown. Select "Right to Left Document"
Or use this toggle macro in Excel 97-2013.